Townhouse is located between Beaverton and Hillsboro on the west side of Portland metropolitan area. Close to Street of Tanasbourne, Whole Foods and New Season stores, light rail station and many local trails, parks Hillsboro Airport and Intel Museum, Rice Museum. A short train ride will put you to downtown Beaverton and downtown Portland, where you will pass places such as Oregon Zoo, Forest Museum and Rose Garden, Lan Su Chinese Garden and Japanese Garden. Major corporate campuses such as Intel, Nike, Tektronix and Synopsis are less than 5 miles away. I have stay in Oregon for almost 30 years and have worked in Portland high tech industry for almost the same amount of time. I enjoyed every bit of what Portland has to offer and invite you to come to Portland and get your own Pacific Northwest experience. I originally purchased this property for people who have to travel to Portland for a long time and ended up stay in places the only way can cook is in your own bedroom. This property give them a clean way to cook their own healthy food, easy integration to the local residents and enjoy most of their stay in Portland. Now I open it to all people who come to Portland for work or pleasure. You will find this is truly your ideal place for your Pacific Northwest experience. Easy access to the free way. 1 hour's drive to the coast and 1 hour's drive to the sky resort. Close to light rail and easy access to wind surfing on Columbia and Willamette River. surrounded by the local hiking trails and parks. 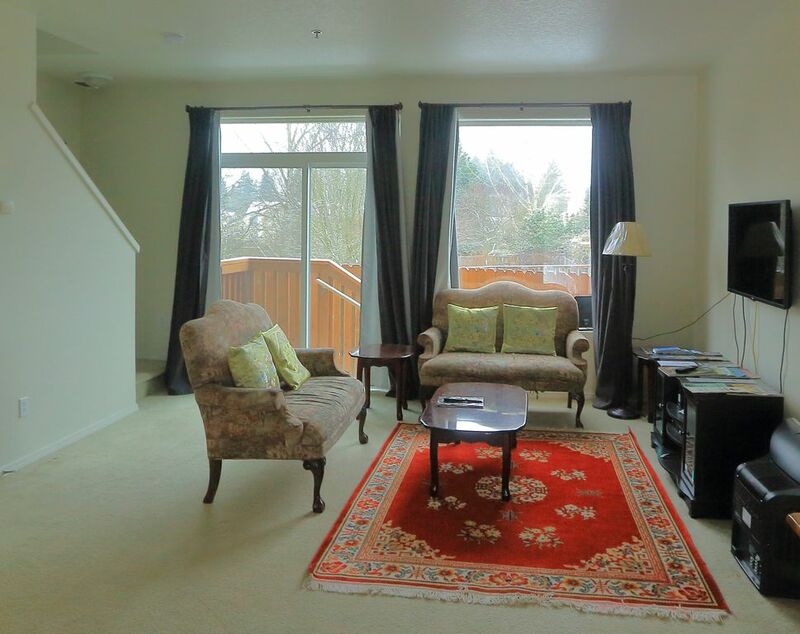 The property was clean, well-furnished, and very convenient to Intel and other places in Hillsboro. Everything worked well. I will plan on staying here again in the future whenever business requires my visiting the area. Excellent house to stay, all perfect. Near to everything. The place is so quiet, definitely, I`ll stay every time that I`ll travel to Portland. Excellent house, everything was perfect. Near to every place that we need to go. Defenitely we will come again. My adult son and I visited the Portland area and stayed in this townhouse. Everything we needed was there. It's in a nice location, tucked back into a "compact" neighborhood, (ie, there is parking but tight quarters for a big vehicle.) but it was very quiet. We didn't get to use the walking paths noted due to very poor weather. A little bit of a hike to the train station, but certainly walkable. Good restaurants and shops within a short drive. One thing that should be noted is the there is no bathroom on the main floor. Both baths are upstairs with the bedrooms. If you have anybody who has problems climbing steps, this wouldn't work. TV experiences a lot of interference with the signal, but wi-fi was strong. Keyless entry was handy. Not really anyplace to sit outside, ie...no patio. Bed was very comfortable. Not necessarily 4 star hotel clean, but worked just fine. Would I stay there again? For the money? Yes. A bargain. We had a great stay here. Very conveniently located with a lot of shopping and restaurants nearby, and a relatively short drive to everywhere we wanted to go including Cannon Beach, Columbia Gorge, and wine country. The townhouse itself is very clean, nicely decorated, and had all the amenities we needed to enjoy our vacation. Thank you!